Roads and homes have been flooded amid weather warnings that more heavy rain could be on the way to south Wales. There are four flood warnings in place in Solva and Haverfordwest in Pembrokeshire – meaning flooding is expected – as well as 12 flood alerts. Pembrokeshire council said “a number of roads” were flooded and were being dealt with on a “priority basis”. Water levels are set to rise at high tide at 19:00 GMT and people have been urged to move cars to high ground. The Met Office has issued an amber weather warning for rain in Pembrokeshire and parts of Carmarthenshire from 13:00 to 23:00. Natural Resources Wales said with heavy rain forecast to fall on already saturated ground, localised flooding and travel disruption could be expected. Its teams are continuing to check flood defences and people have been told to take care near fast-flowing and swollen rivers and not to drive through flood water. Pembrokeshire council has warned home owners and businesses in Haverfordwest town centre to prepare for possible flooding on Friday night. 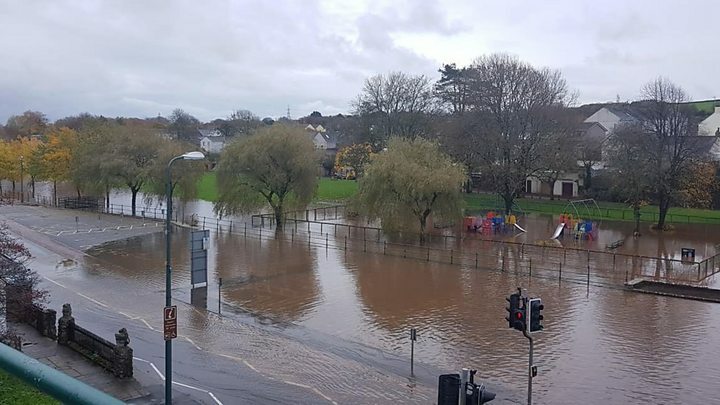 More heavy rain is expected to “significantly increase” the level of the River Cleddau, with Quay Street, the Riverside, Prospect Place and properties near Cartlett Brook. expected to be most at risk. Milford Haven and Pembroke libraries are closed, along with a number of other commercial properties. Five houses in Milford Haven were flooded under 10 feet of water. Scolton Country Park in Haverfordwest was the wettest place in the UK on Thursday, according to the Met Office, with 45.6mm (1.8in) of rain. On Thursday, fire crews tackled flooding inside homes in Angle, Crundale in Haverfordwest and 10 properties in Haven’s Head and Lower Priory, Milford Haven, had to be evacuated. Traffic Wales reported people were evacuated from Lower Priory due to most roads being flooded. First Cymru Buses said it could not access the car park at Tesco in Lower Priory to pick up customers and seeveral roads in Camrose, Slebech and Boncath have also been hit by flood water. Work has also been carried out to tackle water around a service station at Dinas Cross near Fishguard. The amber warning for heavy rain and wind is in place from 13:00 until 23:00, while a yellow warning covers the remainder of south Wales until midnight. Up to 50mm (1.97in) of rain could fall on higher ground, with wind speeds of up to 60mph (95km/h) along some coasts. Amber is the second of three categories of Met Office warnings, while yellow is the lowest. The Met Office said the warning meant flooding is likely and fast flowing floodwater could cause a risk to life. This comes just four weeks after Storm Callum caused flooding across south Wales, with several areas badly affected by high winds and heavy rain.